Swatkins Ultimate Awards are silver plated and are simply the best money can buy and are manufactured for major events worldwide. They are handmade by skilled craftsmen and hold a lifetime warranty against defects in manufacture for life of first ownership. 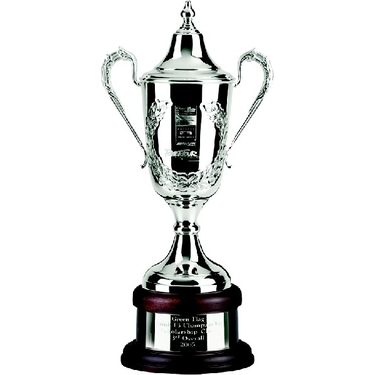 This extremely detailed Trophy Cup features wreath, matching handles and lid and comes complete with solid mahogany plinth and band that can be personalised engraved. Trophy cup ideal for any sporting or corporate event.